Philadelphia, PA (October 6, 2011) – Several Manko, Gold, Katcher & Fox, LLP, attorneys have been named to the 2012 edition of The Best Lawyers in America® ("Best Lawyers")*. Best Lawyers has named Managing Partner Robert D. Fox as the "Philadelphia Best Lawyers' Litigation - Environmental Lawyer of the Year" for 2012. Only a single lawyer in each specialty in each community is honored as the "Lawyer of the Year." According to Best Lawyers, the lawyers named "Lawyers of the Year" have received particularly high ratings in the surveys by earning a high level of respect among their peers for their abilities, professionalism, and integrity. 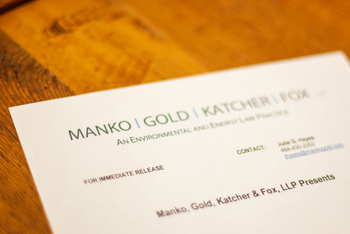 Other MGKF attorneys who were recognized for their work in environmental law and/or environmental litigation include: Joseph M. Manko, Marc E. Gold, Bruce S. Katcher, Neil S. Witkes, Michael M. Meloy, Jill Hyman Kaplan, Jonathan E. Rinde, Bart E. Cassidy, Brenda Hustis Gotanda, and Jonathan H. Spergel.